Jerry Harkness isn't the greatest player to have worn the Pacers uniform. Not by a long shot, pun intended. 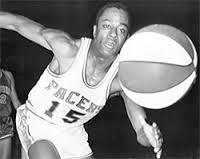 He is, however, the Pacer with the greatest historical relevance in basketball and owner of one of the most dramatic personal histories. While he played in just 81 games and averaged just 7.3 points in the dawning days of the franchise, he has been a game-changer whose contributions have transcended sports – all thanks to one of the sporting world's ultimate game-changers. The 73-year-old is making up for lost time in a life deserving of recognition. Before leaving on his week-long memory spree, he had an appointment at St. Vincent's on Monday for tests on his heart, which has troubled him lately. He isn't about to miss what likely are some of his final opportunities to bask in the limelight, though. 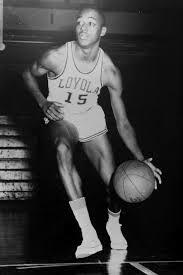 This is the 50th anniversary of Loyola's title, which could reasonably be regarded as the most significant of all in the NCAA tournament's history. As the captain of that team, he never passes on a chance to spend time with his teammates. They had chemistry then, and the living members still have it now. If he gets an individual crumb thrown his way now and then, all the better. “It's been really, really, really neat,” he says. That's Harkness for you. A product of Harlem who has known genuine hardship, he's nevertheless retained an aura of childlike innocence and optimism. He's soft-spoken, upbeat and polite. Grown men tend to use words such as “wonderful” and “sweetheart” to describe him. But his demeanor masks a bold determination that blazed trails. He has been a local version of Jackie Robinson, helping to break down color barriers at various stops along the way. The Loyola team was the first to start four black players, in an era when many teams had none and nobody started more than three no matter how desperate they were for a victory. After college he became the first black salesman for Quaker Oats. 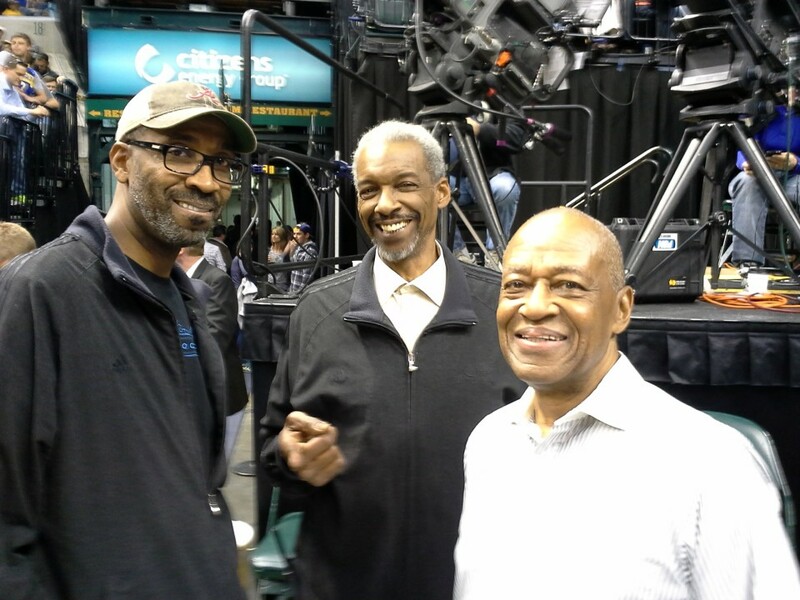 Later, after his career with the Pacers was aborted by injuries, he became the first black fundraiser for United Way, the state's first black sportscaster and one of the founders of the 100 Black Men mentoring organization. It's only appropriate then that if not for Robinson, and a simple statement or two uttered by the baseball legend in passing one day, we likely never would have heard of Jerry Harkness. It was the first of a series of fateful occurrences that leads Harkness to believe his life has been guided by an invisible hand, a moment so seemingly trivial that a screenwriter would rewrite it in favor of something more dramatic. But it changed a life. Harkness' childhood in Harlem was difficult, and shadowed by disappointment. His father, a window washer, had left the household, leaving his mother to raise him and his sister alone. There were days he had nothing to eat, and other days he subsisted on bread and syrup. He put cardboard in his shoes to cover the holes, but when it rained the water soaked through to his feet. He tried to conceal that from his classmates to avoid their taunts, but a kid can only hide from the truth for so long. Frustrated and bitter, he occasionally engaged in minor mischief – stealing a piece of fruit off a cart, perhaps, or hopping over a subway turnstile to get a free ride. Sports helped keep him grounded, though, and he had natural athleticism. He ran cross country and was a distance runner for the track team at DeWitt Clinton High School, but he couldn't bring himself to go out for the basketball team. He had played a season on his junior high team, although “played” isn't the most accurate verb for a kid who barely got off the bench, and he had led his intramural team to a championship the previous season. He wanted nothing more than to play for the school's varsity team, but the guys on DeWitt Clinton's varsity were from another part of town, which only amplified Harkness' shaky self-confidence. What if he went out for the team and got cut? Why add another disappointment to a life that had accumulated several? Better to avoid that possibility altogether. And then came a life's turning point. One day, probably late in the summer of 1958 before his senior year in high school, Harkness was shooting around at the YMCA in Harlem, just killing time. It wasn't something he did very often, because it cost a quarter to use the facilities and quarters were difficult to come by in his neighborhood, which by then had become a housing project in the Bronx. But he happened to be there the morning Robinson of all people passed through the gymnasium. It wasn't that unusual of an occurrence, because black leaders of that time lived in same neighborhoods as poor people. Consider it the upside of segregation. A black person, no matter how successful, had to live with other black people, so black kids got to see, touch and sometimes interact with the doctors, lawyers and sports stars in their midst. And there were no bigger stars than Robinson, who at the time was two years retired from a Hall of Fame Major League baseball career that he had begun by breaking the sport's color barrier and inspiring a major social advancement. Robinson, a close friend of the Y's general manager, took notice of the left-handed kid and threw out an off-hand compliment as he passed by. Something like, “Hey, kid, you're not bad!” Harkness isn't sure, but Robinson might have also added a comment along the lines of, “Maybe you could get a scholarship someday.” Or words to that effect. If the exact words aren't clear in Harkness' memory, the impact left no doubt. Encouragement from an icon was all he needed to be convinced to go out for the high school team. If Jackie Robinson of all people believed in him, how could he not believe in himself? Things progressed quickly from there. Harkness went out for the varsity team at Clinton, made it, moved into the starting lineup early in the season, led it to the city championship and played a starring role in the title game at Madison Square Garden. He played against the likes of Roger Brown, who would become a Pacers teammate and Naismith Hall of Fame inductee. On the playgrounds the following summer he played against Larry Brown, who would become an ABA opponent and Pacers coach. He and future Pacers president Donnie Walsh might have shared an asphalt court a time or two that summer. They aren't certain, but they at the very least were aware of one another. Harkness needed another nudge from fate to find his way to Loyola, however. He could have gone to St. John's on a track scholarship, but his grades weren't sufficient. NYU later offered a basketball scholarship, but he failed the entrance exam. He stayed in Harlem the following school year and then Walter November, a local AAU coach and mentor for players in the area, lined up a scholarship for him at Texas Southern. The dormitory in which he was to live burned to the ground before he could get to campus, however, canceling that opportunity. Finally, with the next school year about to begin, November convinced Loyola of Chicago coach George Ireland to give Harkness a chance. Ireland was in the midst of revolutionizing college basketball by ignoring the unwritten restrictions of the day and recruiting black players. It was the only way for a small Jesuit school to compete with the major powers, and Ireland was untouched by the virus of racism. By the time Harkness was a senior at Loyola, four black players were in the starting lineup, two from Nashville, Tenn. and two from New York City. Loyola won the NCAA title in 1963, but had to clear more rubbish from an uphill path along the way. Southern teams in the early 1960s were heavily segregated, and southern cities were inhospitable to blacks. Loyola's players experienced that firsthand. In Houston, the fans taunted them during the game, chanting "Our team is red hot! Your team is all black!" They were not allowed to eat at the same restaurant as the whites afterward, just as in New Orleans. There, the black players were put up with local black families rather than at a downtown hotel with the rest of the team – which turned out to be a positive experience because they were received as conquering heroes. Loyola finished the season ranked second in the country, behind Cincinnati. It easily dispensed of Tennessee Tech in the opening round of the tournament, 111-42, setting up a showdown with Mississippi State. Problem was, Mississippi State, which was ranked sixth in the country, had never played against teams with black players. It had passed on competing in the NCAA tournament in 1959, '61 and '62 for that reason, despite having gained eligibility for it by winning the SEC title. Segregation was so ingrained in the conference that it wasn't until 1967 a black player would be admitted to one of its teams. But barriers were falling at other schools around the country, and SEC schools were becoming isolated. No longer able to ignore the winds of change, including those on his own campus, State president Dean Colvard announced the team would play in the tournament in '63. Mississippi governor Ross Barnett, who had campaigned as a segregationist, filed an injunction to prohibit the team from leaving the state, but coach Babe McCarthy had already crossed the border so he could not be served. Colvard helped organize a plan in which the players were driven across the state line to Tennessee and flown out of Nashville to the game on Michigan State's campus in East Lansing, escaping authorities. 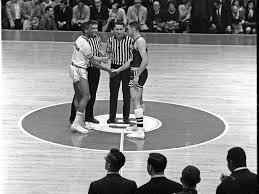 State's participation made for such a historic moment that when its captain, Joe Dan Gold, shook hands with Harkness at center court before the opening tip, the sound of popping flash bulbs from the cameras of newspaper photographers echoed throughout the fieldhouse. They ring in Harkness' ears to this day, a sweet melody of progress. Loyola's players at that time weren't aware of all that State's team had gone through to get to the game, but neither was the significance of the moment lost on them. “Deep down, we knew this was something special,” Harkness says. Loyola won the game, 61-51, with Harkness scoring 20. McCarthy said afterward his team might as well have stayed home, it had no chance to beat such a powerful opponent. The Ramblers went on to beat Big Ten champion Illinois by 15 points, with Harkness scoring 33 points, and then Duke by 19, setting up the championship game with Cincinnati. It was meant to be: the two highest-ranked teams in the country playing for the national championship. Cincinnati, led by two more future Pacers, Tom Thacker and Muncie's Ron Bonham, led by 15 points with 14 minutes remaining, but Loyola's desperate fullcourt press took its toll. Harkness hit a 12-footer to force overtime, and then scored a layup off the opening tip of the extra session to give Loyola its first lead of the game. He also had a chance to hit the game-winning shot in the final seconds, but Bonham had a hand in his face and forced him to pass off to Les Hunter. Hunter's free-throw line jumper missed, but was tipped in by Vic Rouse at the buzzer for a 60-58 victory. Loyola remains the only Jesuit school and the only college from the state of Illinois to win the NCAA tournament. Its greatest distinction, however, remains its role in helping to mix college basketball's color palette. Texas Western would win the NCAA title three years later with an all-black starting lineup, beating an all-white Kentucky team for the championship. That game inspired a movie, Glory Road. Loyola's story, however, celebrates integration, and was more of a factor in inspiring change within basketball and society. It wasn't black vs. white, it was blacks and whites crashing through barriers and coming together like never before. Harkness' son, Jerald, directed a documentary, Game of Change, in 2008 that tells the story. Harkness would later learn that Mississippi State's players and most of the student body wanted to play that game in East Lansing, contrary to the bias of the politicians. He recalls the respect he saw in the eyes of State's players before the game began. And in recent years, as the historical significance of the game has become more recognized and celebrated, he has become friends with some of them. Had the story ended there for Harkness, his life would be full, and the invitations to banquets, Halls of Fame and the White House would still be pouring in. He was a two-time All-American and captain of a national championship team, enough to assure him of at least a footnote in the history of college basketball. But that was just the beginning. Harkness completed his college career on a puffy white cloud. He had been the captain of a team that won the NCAA championship with a dramatic overtime victory, and was voted a consensus first-team All-American after the season. The glow continued into the Spring. He was voted the Most Valuable Player in the East-West All-Star game in Kansas City following the season, playing for a team coached by UCLA's John Wooden, who was one year away from winning his first NCAA championship. And then, on April 30, his hometown Knicks drafted him with the ninth overall selection – the first pick of the second round – in the NBA draft. It seemed a perfect fit. Harkness would be going home, playing in Madison Square Garden where he had led his high school team to the city championship five years earlier, and the Knicks would seemingly benefit from adding a local kid who had achieved national fame. It didn't work out. The 6-3 Harkness had played small forward in college, but struggled to make the transition to guard in the NBA. He played in just five games, scoring 29 points, before he was released. The transition to a new position, the pressure to perform in his home city and already-aching knees had limited his production. “I just didn't play well enough,” he admits. He had options, though, and assets: a college degree, All-American status and the solid reputation that goes with being a team captain. He landed a sales job with Quaker Oats in New York, then was transferred to Chicago, with a territory on the north side. Part of his role with the company was to run youth clinics as well, emphasizing physical fitness. He also was experiencing his own Robinson-like moment as the company's first black salesman, breaking more barriers. He was earmarked for promotion, and seemingly destined for a management position, and still was able to scratch his playing itch by playing semi-professional ball for a championship team in Benton Harbor, Mich. on weekends. He seemed settled into his new life with his wife and infant daughter when, three years later, he read an article in the Chicago Tribune about a new professional league. It would be called the American Basketball Association, it intended to compete against the NBA, and Indianapolis was one of the cities planning to start a franchise. Harkness, still believing he had more to offer than he had shown with the Knicks, wrote a letter to Bob Collins, The Indianapolis Star's sports editor, inquiring about a tryout. The letter was passed on to Pacers management. It was a huge risk on Harkness' part. What if he didn't make the team? What if the league didn't survive? Quaker Oats had warned him, telling him there was no guarantee of getting his old job back. The company had invested in him, put him on a track toward management – no small thing for a black man in 1967. But Harkness couldn't get basketball out of his mind. Robinson's words had convinced him to take the risk of going out for his high school team, and it had worked out beyond his expectations. Why not try again? Harkness joined an open tryout the Pacers put on in June. Two NBA veterans from Indiana, Bob “Slick” Leonard and Clyde Lovellette, ran the practices like a boot camp to weed out the less serious contenders. Harkness was among those caught off-guard. He finished poorly in the sprints, and vomited. His name no longer carried weight, either. The first mention of him in the local newspapers came after one of the public scrimmages, when he had scored 10 points. The Indianapolis News' article referred to him as “Larry” Harkness. His gamble had paid off. Mike Storen, the Pacers' first general manager, wasn't aware of the risk Harkness had taken to try out for the team, and doesn't recall the discussion that led to keeping Harkness on the roster. But he does remember the intangible qualities Harkness brought to the team. “You knew when you met Jerry that he was an accomplished person,” Storen says. “He wasn’t somebody who was a basketball junkie who was going to spend the rest of his life trying to demonstrate that he could play basketball. It was clear he had a great head on his shoulders. The perception was he didn’t need basketball psychologically like a lot of people do. Harkness' brief career with the Pacers isn't remembered for intangibles, though. It's remembered for a fateful fling in Dallas that won a game and vaulted him into history. It came in the Pacers' 15th game, on Nov. 13. John Beasley had scored on a short jump shot with one second left to give the Chaparrals a two-point lead and seemingly securing the outcome. But Oliver Darden flipped a short inbounds pass to Harkness, who heaved a high-arcing left-handed hook toward the opposite basket. It was one of those moments when life seemed to shift into slow motion. As the ball sailed through the air, the Dallas players were still celebrating Beasley's shot and echoes from the cheers of the intimate gathering of fans could still be heard. The final buzzer sounded, too, and then the ball miraculously smacked the backboard and dropped through the basket. The immediate reaction among the Pacers was that Harkness had tied the game and forced overtime. The ABA had installed a three-point shot, but this wasn't a jump shot taken from behind the three-point line. This was a lucky heave. But it counted just the same, and gave the Pacers a 119-118 victory. It was first recorded as a 92-foot shot because it was taken just a couple of feet inbounds on a 94-foot court, but it was later realized the rim stands four feet inbounds, so it was adjusted to 88 feet. It stood as the longest shot in the history of professional basketball until Baron Davis hit what was reported to be an 89-footer at the third-quarter buzzer in 2001. But that shot didn't win a game. There's no video record of the shot. The game was not televised, and television stations in those days didn't shoot highlights at games. The attendance was listed at 2,115, but Storen, who attended the game, estimates fewer than a thousand were on hand. It turned out to be the highlight of Harkness' professional career, and his only three-pointer in five attempts. Two nights later, the Pacers played Oakland at the Coliseum. Before the game, a member of the United State Marine Corps color guard pinned a sharpshooting medal on Harkness' jersey in a pre-game ceremony before the Pacers' smallest crowd of the season to date, 5,885. Harkness scored eight points in a 119-110 victory that improved their record to 13-3. That turned out to be the high point of the season, however. They finished 38-40 as the rest of the league – which hadn't been as well-organized or conditioned before the season began – caught up, and they were swept by eventual champion Pittsburgh in the first round of the playoffs. The Pacers started 0-3, but won their fourth game, over Denver, as Harkness “handcuffed” former Duke All-American Bob Verga and contributed 10 points, eight rebounds and seven assists. Harkness then scored a career-high 17 and “played tenacious defense” in the next game, a loss to Houston. He eventually was moved into the starting lineup, and scored 16 in a loss at Oakland that dropped the record to 1-7. Staverman was fired the morning of the next game in Los Angeles, coached it anyway, and got a 112-107 win as a parting gift. When Leonard took over upon the team's return home from the three-game road trip, Harkness remained a starter. He scored 11 points in Leonard's debut, a loss at Minnesota on Nov. 15, but was served a harsh notice that the end was near. When he tried to fake Chico Vaughn, he felt a sharp pain in his back. He also got caught from behind on a fastbreak, something that had never happened before. He stayed in the game, but couldn't move well enough to contribute. The body that had carried him through all those distance runs in high school and all those games on the asphalt courts of New York City was breaking down. His knees hadn't been good when he first made the Pacers' roster as a 27-year-old, and his efforts to baby them had put too much strain on his back. He returned home after the game at Minnesota to try to rehabilitate his injuries while the team carried on with the remainder of its seven-game road trip. He rejoined them for a home game against Dallas on Nov. 27, scoring two points, rode the bench the following game two nights later, and was left home for the ensuing road trip that began on Dec. 2. Finally, on Dec. 4, his retirement became official. The roster limit for ABA teams that year was 12, but they could only take 10 on the road to keep expenses down. Harkness could have been kept for home games, at least, and given time to try to recover, but to his surprise he was cut loose. “I guess they don't want to take a chance on my back going out again, but I think I deserved a chance to win my job back,” he told one newspaper reporter. Years later, however, he recognized it had been a blessing he got out before doing further damage to his body. Harkness stayed on with the Pacers' front office the rest of that season, working as a college scout and an analyst on some television broadcasts. A year later, in 1970, Storen took over as general manager of the Kentucky Colonels and offered Harkness a front office position there. He turned it down, preferring to stay in Indianapolis. He had more worlds to conquer. He became the city's first black professional fund-raiser, working for the United Way. He was a co-founder of Black Expo. He became the state's first black television sportscaster for the local ABC affiliate. He gave morning reports on radio station WTLC. He multi-tasked like a mad man for a while, going to the radio station early in the morning, working for United Way during the day and handling weekend sportscasts on Channel 13. He admits he wasn't a natural for television. He only did it to break down another social barrier and perhaps open an opportunity for someone else - and, admittedly, recapture a few rays of the limelight basketball had once provided. Harkness was so involved in mainstream community activities and so popular with so many white people that some of the more radical members of the city's black community suspected him of being an FBI informant. He gradually gained widespread acceptance, and never backed off his community involvement. He has coached or mentored countless city kids over the years with various organizations, far out of the spotlight. He can't help but wonder what would have become of him if not for those few, simple syllables Jackie Robinson had directed his way in the summer of '58. to get a good job. My father washed windows at United Nations building, and made $100 a week. I thought that was great. One of those opportunities came from his friendship with Gold, the Mississippi State captain whose handshake with Harkness had set flash bulbs popping on that historic day in East Lansing. The Loyola and Mississippi State players, and their wives, became friends after reunions brought them together. Harkness attended Gold's funeral service in Kentucky in 2011. He was the only black person in attendance, but embraces ensued and tears flowed. A photo of the midcourt meeting between the two was displayed to the left of the casket. Nothing could have crystallized the ultimate meaning of that historic tournament game in 1963 better than that private moment in the funeral parlor. Harkness never got a chance to thank Robinson. He saw him one day on the streets of Manhattan, when Robinson was working as a vice-president for Chock Full O' Nuts, a coffee company and was walking ahead of him with his distinctive pigeon-toed walk. Harkness wanted to approach him and tell him how much he had meant to his life, but couldn't muster the courage. Maybe it's just as well. It would have been impossible to relate the story of Robinson's impact on his life on a bustling city sidewalk. Harkness' life has served as non-verbal gratitude. Appreciation has come full circle for Harkness, too. 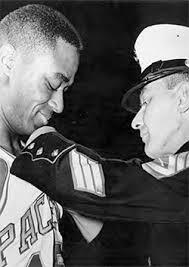 When Loyola won the championship in '63, an 18-year-old student in Pine Bluff, Ark. named O.T. Gordon watched in awe on television. He was a black kid from the South, with seemingly limited options. But if a team consisting of four black starters could win a national championship, who was to say he couldn't make something of his life? He became a doctor, and eventually practiced in Indianapolis. Nearly 50 years after Loyola's win, while examining a patient, he found early indications of colon cancer. Thanks to the early detection, it was eradicated and the patient is cancer-free. That patient's name, of course, is Jerry Harkness. Just as Robinson had inspired Harkness, Harkness helped inspire Gordon, who perhaps saved Harkness' life. Which was the best form of thanks a man can receive. (1) A greater honor was still to come. The Loyola team was inducted into the College Basketball Hall of Fame in November of that year.